Talk show host Richard Doherty met with students from King Middle School to talk about PODCASTS and making great radio stories. 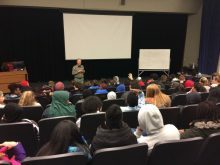 The students will be producing short audio features that highlight environmental issues. The students and Richard held a workshop USM’s Talbot Auditorium where they learned about recording, writing and producing a podcast. Look for these stories on Ecotones heard Thursdays at 1pm, and in the future the students will have their own Podcast. Thanks to teachers Elaine Colella and Gus Goodwin for making this happen. Middle School Mic Drop is Back! Middle School Mic Drop is back after a name change and hiatus! Young people make great radio on WMPG! Tune into Middle School Mic Drop Saturdays from 9-10am with a team of local youth chatting about what matters to them and spinning some music they love! The Maine Women’s Policy Center sponsored a 2018 Gubernatorial Forum on Women’s Economic Security at USM on Sunday October 21, 2018. Three candidates took part: Democrat Janet Mills; Independent Terri Hayes; and Independent Alan Caron. Ann Schink of the League of Women Voters of Maine moderated the Forum. Co-sponsored by WMPG we offer the forum to hear from the candidates on issues that effect women’s lives. WMPG Community Radio joined with: Portland Media Center; The First Amendment Museum at the Gannet House in Augusta; and the New England First Amendment Coalition to celebrate National Free Speech Week, October 22 through 28. On Oct 8th, WMPG’s own Christopher the Hermit presented a special program featuring Native American music, words, stories and interviews. 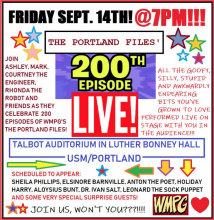 Ashley, Mark and Courtney knocked everyone’s socks off during a live performance of The Portland files on Friday September 14th at 7pm in USM’s Talbot Auditorium in Luther Bonney Hall. 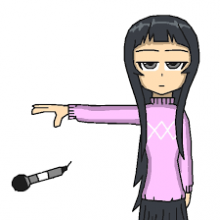 We are now gathering a team of adults and middle schoolers to produce a live weekly one-hour show on Saturdays 9-10am called “Middle School Mic Drop. The middle school aged kids will be on air, and the adults will supervise. Blunt Youth Radio has moved to Tuesday Nights! 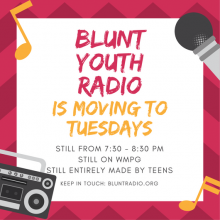 WMPG’s “Blunt Youth Radio Project” has made the big move to Tuesday night! Blunt will still be on from 7:30 to 8:30 pm EST and will still be a live call-in, public affairs talk show entirely produced by teens. YOUNG PEOPLE MAKE AMAZING RADIO!! Querying the Past is a 6-week special series that will air on Thursday evenings 7-7:30pm. We will air 6 unique programs every Thursday evening over 6 weeks and the first episode began on Thursday June 14th in honor of Pride Portland Week. This series comes from the LGBTQ Maine Oral History Project that is collecting and preserving the voices and stories of members of the Southern Maine LGBTQ community. The Principle Investigator for this project is Dr. Wendy Chapkis, Professor of Sociology and Women & Gender Studies at the University of Southern Maine. Professor Chapkis is also the Faculty Scholar for the Sampson Center’s LGBTQ+ Collection (from 2016 through 2018). The LGBTQ Maine Oral History Project integrates USM students into the process of community-based research; after being trained each fall, students serve as interviewers and transcribers of the oral histories.